Addition of an alloy that introduces heterogeneous nuclei into the molten metal for eutecticsolidification. This is preferably performed shortly before or during casting. In addition to the carefully directed graphite precipitation (number and size of spherolites, graphite form), adjustment of a favorable nucleation state also results in obtaining the required matrix (promotion of gray solidification and prevention of ledeburitic white solidification, s .a. Metal matrix of cast iron, Structure formation of cast iron) along with the desired properties. 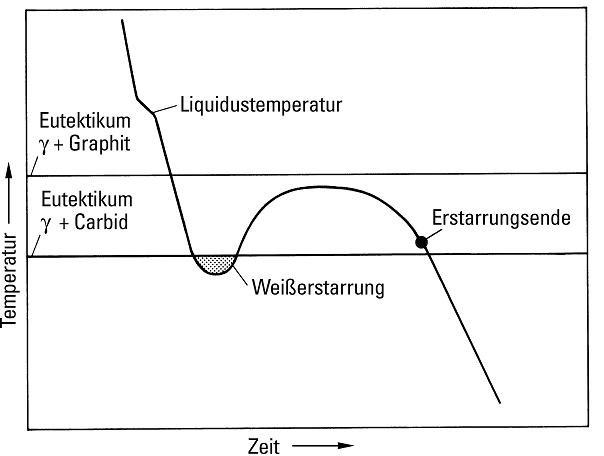 The inoculation additive primarily causes increase of the number of nuclei and thus proliferation of eutectic grains so that undercooling below the metastable equilibrium temperature and potential formation of supercooled graphite (see D graphite) and ledeburitic carbides is prevented (Figures 1a to 1d). In practice, inoculation is equal to late addition of a highly silicon-containing substance that quickly dissolves and results in great silicon concentration in the melt. To this end it is required to introduce the additive all at a time. Above all, inoculation causes an imbalance in silicon distribution within the melt, i.e. occurrence of a “Si cloud”, which additionally promotes formation of the austenite / graphite eutectic. Slow and even distribution of the “Si particle cloud” within the melt causes the quieting or fading effects in practical operation. These effects are manifested by reduction of the particle count on the one hand, and by the “Si particle cloud” disappearing as a result of diffusion, on the other hand, with the latter being the more important of the two consequences. 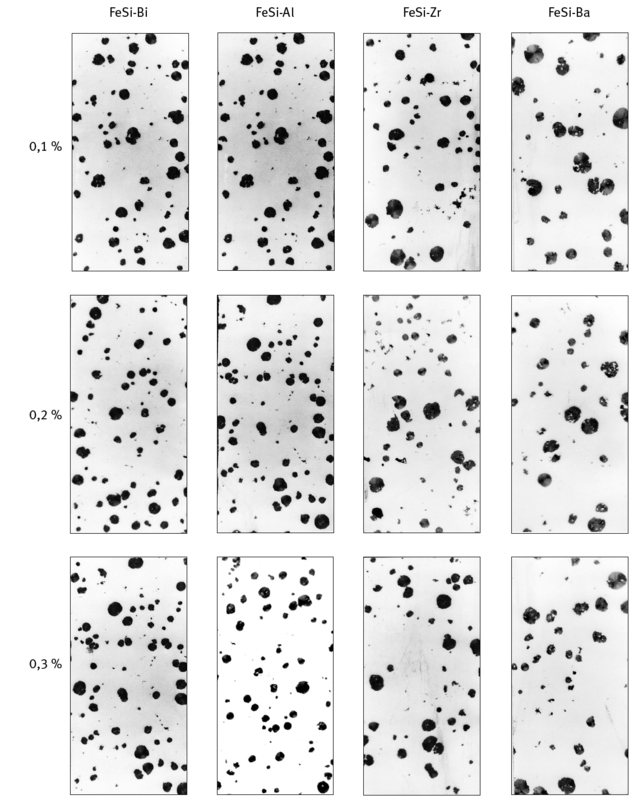 The driving force for diffusion is virtually zero and the particles are (although present) ineffective due to their small sizes. Therefore it is particularly important for nodular graphite cast iron to carry out inoculation shortly before casting. The heterogeneous “Si particle cloud” must be maintained. Inoculation for nucleation comprises addition of an alloy that introduces heterogeneous nuclei into the molten metal for eutecticsolidification. In addition to silicon, these special alloys mostly contain elements with particularly high affinity for oxygen and nitrogen causing diffusion within the melt subsequent to addition. These alloys are the most effective if they are added at possibly low temperatures shortly before or during the casting process. While graphite, silicon, and al-free ferro-silicon have almost no effect if added as alloying elements, specially developed inoculation alloys are highly effective. The most common inoculants are all composed around a ferro-silicon (FeSi) basis and contain additions of elements with great affinity for oxygen and/or sulfur: Potassium, aluminum, barium, strontium, zircon, bismuth, cerium and rare earths. Some inoculation-effective components of the inoculants are “natural” constituents of FeSi, particularly Ca and Al, which are taken up into FeSi through the raw materials. “Inoculation-FeSi 75” is a FeSi75 substance with sufficiently high Ca and Al contents for inoculation. The complex alloyed “special inoculants" have higher contents or additional elements, such as Ba, Sr, Zr, Bi, RE (rare earths), whose composition is not only formulated with regard to inoculation effect but also in view or influencing the graphite form. There are also FeSi-based inoculants with graphite additives through which graphite nuclei are introduced into the melt in addition to the resulting oxides. The effect of the inoculation treatment is temperature-dependent and limited in time. In this way, the influences of the crystallization times also become clear. While the areas in series castings with conventional wall thicknesses from 8 to 25 mm solidify within minutes, crystallization of thick-walled, heavy castings with wall thicknesses from about 80 mm may take hours. These time differences imply more intense decay of the inoculation effect in large castings and consequently prevention of growth centers and longer crystallization time for eutectic grains. Both results in lower spherulite counts and larger eutectic grains present in large castings. With the late inoculation processes optimum inoculation results are achieved with minimum inoculant additions due to prevention of appreciable decay times and thanks to low temperatures. As a general rule, ladle inoculation is not capable of achieving the maximum effects obtained with late inoculation, since with late inoculation it is possible to produce thinnest casting walls free of carbide and with maximum spherulite counts. The most effective late inoculation processes utilized in practice are stream inoculation and mold inoculation. With these processes, the inoculant is blown into the stream during casting in a precisely dosed quantity, or similar to the inmold method, positioned into the mold and thus dissolved by the liquid iron. Inoculation influences the number, size, and partly also the shape of graphite diffusions through the balance of nuclei in the cast iron melt. 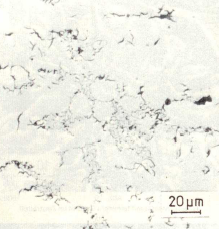 In principle, well inoculated iron has a higher spherulite count than poorly inoculated iron under otherwise equal cooling conditions (wall thickness) as is illustrated in Figure 2. However, it must be noted that with equal wall thickness and equal inoculant quantity, the specific spherulite count is not so much influenced by the addition quantity but mainly by the type of inoculant. FeSi-Bi produces the highest spherulite count, followed by FeSi-Al, FeSi-Zr, and FeSi-Ba. 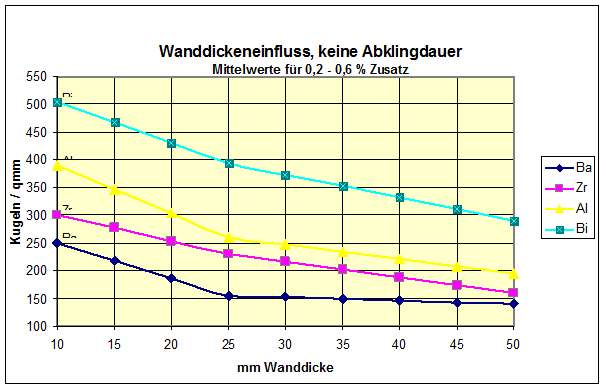 Figure 3 illustrates a comparison of spherulite counts for the various inoculants and addition quantities immediately subsequent to inoculation with casting wall thicknesses of 10 mm and Table 1 represents the summary of the comparison. Figure 4 shows the reduction in spherulite count over the decay period. With regard to spherulite count, the most significant decay effect can be observed within the first 3 minutes after inoculation; after that, there is a comparatively low decay in spherulite counts. With great melt masses, the decay effect takes place considerably slower. Differences among inoculants that are present immediately subsequent to inoculation are relatively low after the decay period. Only FeSi-Bi can be clearly distinguished from the other inoculants by that time. 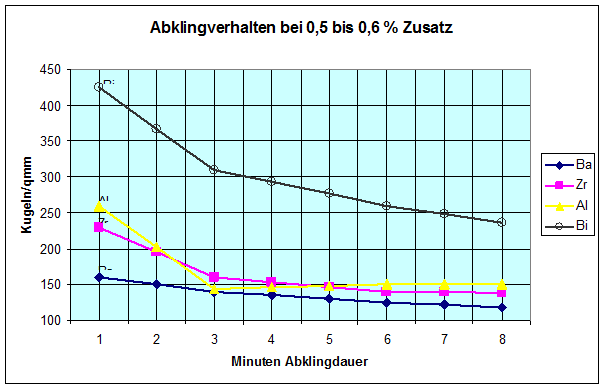 Figure 5 illustrates the influence of the wall thickness on the specific spherulite count by means of mean result values directly after inoculation. The specific spherulite count is always approx. 1.5 to 2 times higher with FeSi-Bi than with other products; however, in thick-walled parts FeSi-Bi is likely to influence nodularity. 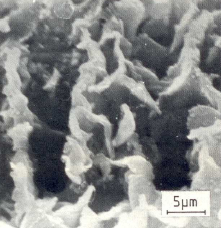 Due to its generally higher tendency towards supercooling and its Mg content nodular graphite cast iron would solidify to a mottled structure in non-inoculated condition. With GJS, gray solidification is only induced by inoculation; the specific spherulite count is increased and nodularity is improved. For clarification of the inoculation result subsequent to a 0.2% ladle inoculationfigure 6 shows a comparison between conditions after magnesium treatment during transfer into the casting ladle and conditions after additional mold inoculation of nodular graphite cast iron: The Y0 sample was mottled after ladle inoculation (approx. 30 % carbide), with a hardness of 240 to 290 HB. Additional mold inoculation has completely prevented carbide formation in the Y0 sample but the hardness is only 180 HB. Due to significant increase in the the specific spherulite count through mold inoculation the pearlite proportion was reduced from around 80% to approx. 35%. This and the prevention of carbide formation contributed to a significant increase in elongation at failure in the tensile test. 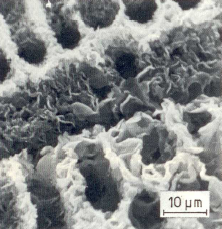 What is more, late inoculation is also capable of significantly improving structure formation in medium- to thick-walled parts; to be precise, in thick-walled nodular graphite cast iron it practically is the last option (along with implementation of chills) to increase the specific spherulite count. High specific spherulite counts also minimize undesired segregation phenomena, grain boundary carbides, and graphite degeneration.